Alpha Alpha Delta Omega will contribute to the 2018-2022 Alpha Kappa Alpha international program, Exemplifying Excellence through Sustainable Service. Through this program, we have an opportunity to address community needs in various target areas. Many individuals living in poverty around the world lack access to basic eye care services. The Lions Club recognizes the urgent need for corrective lenses and collects usable glasses for these communities. Alpha Alpha Delta Omega will be collecting preloved corrective eyeglasses. If you have eyeglasses that you wish to donate, please email info@torontoaka.ca. Alpha Alpha Delta Omega partnered with The Reading Partnership for The One for the Books: Books & Braids literacy event. This event featured Alpha Alpha Delta Omega's very own author, Ndija Anderson-Yantha, who read her book, What are you gonna do with that hair?, followed by a discussion and braiding demonstration for children and their parents. The ​ #UCAP program was designed to assist students, particularly Black students, in their efforts to enter University and College. Members of Alpha Alpha Delta Omega provided mentorship throughout all stages of the application process. #UCAP also provided funding for the participants' OUAC and OCAS applications. Alpha Alpha Delta Omega partnered with the Commonwealth of Dominica Ontario Association to help with sorting and packing boxes to be sent to families in Dominica impacted by Hurricane Maria. 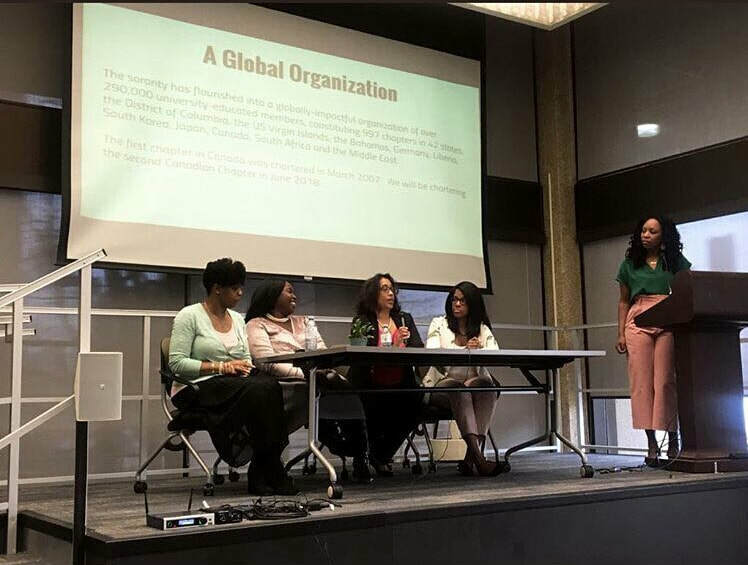 Members of Alpha Alpha Delta Omega sat on a panel to discuss creating a sisterhood, facilitated by our president, Dr. Renee N. Rawlins at the 1st Annual Black Women's Gathering. This took place at OISE at the University of Toronto. Members of Alpha Alpha Delta Omega in attendance at the Black Community Provincial Leadership Debate, ready to take all that was learned back to our communities.